Avril et le monde truqué is an animated steampunk movie based on the comics by Jacques Tardi. 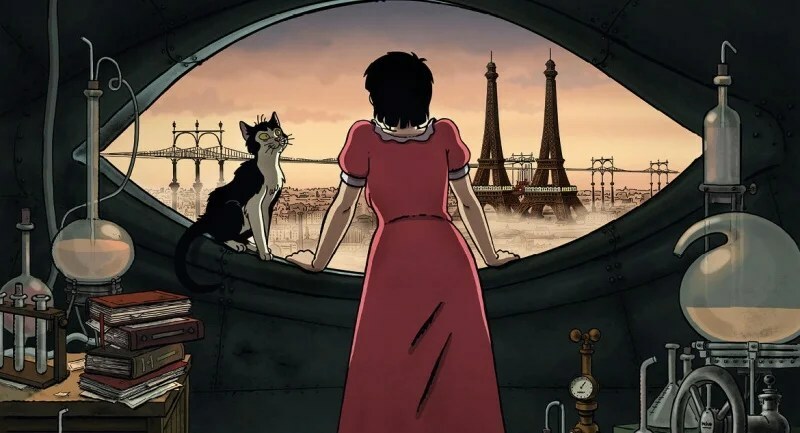 It portrays an alternate-history world in which technology has developed along a different steam-based track since the beginning of the 19th century. Protagonist Avril experiences a hectic Miyazaki-style adventure (e.g. with a talking cat) in places inspired by Jules Verne. That sounds like an appealing combination. Whether the movie will be shown in Swedish cinemas is still not clear, but I will certainly buy the DVD whenever it gets available. I have loved books since childhood and therefore libraries have been sanctuaries to me. When I was a kid in the 1960s, my parents took my sisters and me once a week to the nearest public library, where I filled a big bag with fresh loans. My father assisted me in finding the books I wanted; in those days the filing systems were bulky card cabinets that were unwieldy for a short boy. Pour exécuter de grandes choses, il faut vivre comme si l’on ne devait jamais mourir. Notre monde, demain, sera ce que nous voudrons qu’il soit. Mais il faut le vouloir durement et longtemps.